Fledgling firms based in SETsquared Bristol – part of the global number one network of university-backed incubators – created more than 1,000 jobs and raised a combined £82.1m last year, new figures show. The 80-plus active members of the incubator based in Bristol’s Engine Shed enterprise hub also collectively created £43.5m in revenue in the past year. In 2018 some 26 SETsquared Bristol members secured funding to support business growth and further the development of their tech. Some of the biggest successes of the year were Ziylo, which sold rights to its glucose binding molecules to Danish pharmaceutical giant Novo Nordisk in a deal potentially worth up to £700m, and Ultrahaptics, which raised £35m in an oversubscribed Series C funding round. 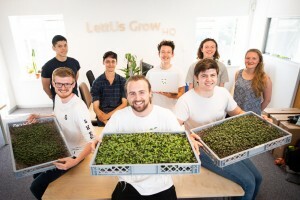 Other SETsquared Bristol members to successfully gain investment last year were KETS Quantum Security, which raised more than £2m, Good Sixty, which crowdfunded £188,650, and LettUs Grow, pictured, which received £1m in a fundraise combining grant and equity investments. LettUs Grow co-founder Charlie Guy said: “The SETsquared partnership has provided our team with substantial support, actionable advice, and insightful training over the first few years of the company’s life. “The value of their network is one of their strongest assets, they have made introductions to a wide variety of influential and experienced business mentors and associated businesses, giving us much wider exposure than we could have garnered alone, and making connections that we may not have thought of. Following a report last year by research partners ACH and Up Our Street, SETsquared Bristol has been working towards implementing key recommendations to diminish the barriers faced by individuals from BAME backgrounds in accessing business support. This has included a marketing audit carried out with the help of The Social Detail and running the popular #Idea2Pitch workshops in community venues to attract a wider audience and strengthen relationships with local organisations. SETsquared Bristol will continue to implement further recommendations from the research and is dedicated to increasing access and visibility of their services to BAME tech entrepreneurs. The incubator has also achieved a 150% increase in female founders in just three years, with 23% of companies led by women in 2018. SETsquared Bristol centre director Monika Radclyffe said: “2018 was a brilliant year for SETsquared Bristol. We have celebrated a number of notable successes and will build on these achievements to set new goals for the future. The SETsquared Partnership is a collaboration between five leading research-intensive universities: Bath, Bristol, Exeter, Southampton and Surrey.